The third and final day of our trip was a spin down the north east coast between Seahouses and Tynemouth before a final run along the Tyne to the finish in central Newcastle. In 73 miles, there proved to be only 718 metres of climbing and a maximum elevation of only 52 metres – it could have been Norfolk! Initially the route continued in similar fashion to the previous day – running along narrow lanes through small villages, sometimes diving inland to avoid busier roads before rejoining the coastline. At times this proved slightly frustrating as the route seemed to double back on itself, doing two miles round three sides of a rectangle to avoid half a mile of A-road. The early morning was enlivened by a farmer herding sheep along the road and over a level crossing of the main East Coast main railway line – I'm not sure what would have happened had the crossing barriers had descended at the wrong moment. We managed to miss two of the highlights of the route – Craster village famed for it's kippers, and Dunstanburgh Castle, because the group's objective was to finish, not necessarily sight-see. A pity, and quite a difference to a solo tour. However the mock gatehouse across the road certainly looked impressive and was at the more serious end of traffic calming measures that I have seen. 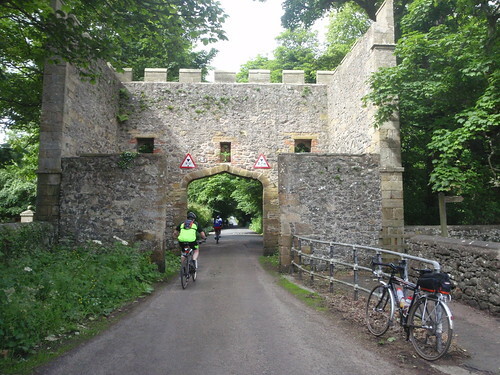 Beyond the castle, there is a choice of two routes – on-road and inland through Longhoughton or off-road along the coast. My small group opted for the longer road route, swayed by the promise of a refuelling rendezvous with the minibus. Others went off-road along the coast which became quite an epic when one or two lost the route and ended up on a narrowing path halfway down a cliff. Luckily discretion got the better of valour and they retraced their steps to the proper track. And then onwards through Alnmouth to Hipsburn, where the only poor signage that we encountered on the route caused us to take a wrong turn and climb a small hill before we realised our error and corrected ourselves – why do such route-finding errors usually involve an unnecessary hill climb?! Warkworth village looked a very pretty place nestled in a loop of the River Coquet – a stiff climb up the busy main street with the ubiquitous castle a brooding presence at the top. The short ride onwards into Amble was right alongside the river estuary with many boats moored up. Amble itself was extremely busy with people out enjoying their Sunday. After two days of cycling through relatively empty countryside, it was a shock to suddenly arrive in such a bustling centre. The fish and chip shops were certainly doing a roaring trade. While most of us cyclists stuck with bananas, flapjack and pasta, at least one of our number succumbed to a hitherto unknown treat of a fish butty – an enormous battered cod not at all contained within a bread roll. I know that it is said that you can eat anything on a cycle tour and it doesn't matter, but I suspect that was stretching the point somewhat. Beyond Amble, the route stays close to the coast but often snaking amongst sand dunes, at times providing only fleeting views of the shoreline. There were more offroad sections through a number of nature reserves on grass and sandy surfaces – 700x23C tyres would not have been the greatest choice. 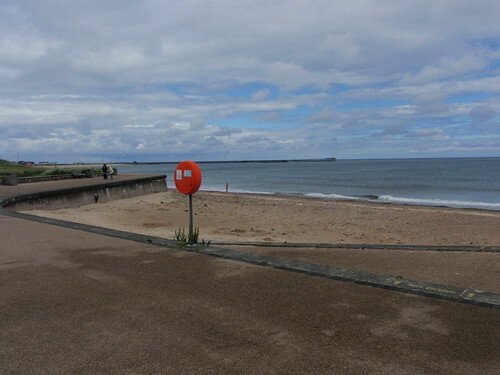 After miles of countryside cycling, Lynemouth proved something of a shock to the system. The aluminium smelting works has certainly left it's mark on the landscape, and it's recent closure also removed the largest source of employment. The fact that it had started to rain added to the tangible feeling of post-industrial blight. 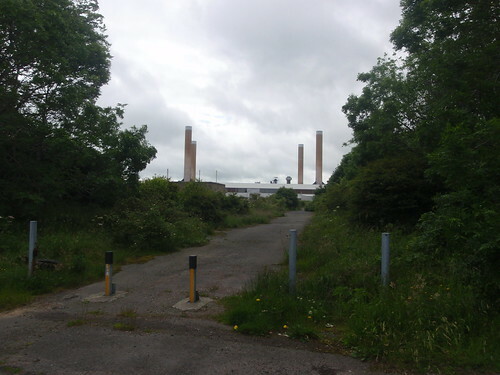 Lynemouth aluminium smelter – a 20th century 'ruined castle'? Beyond Lynemouth, the route followed cycle paths alongside the A189. The town planners had done their work and the route seemingly managed to route around three sides of each roundabout with barriers to protect every road-crossing. It made for frustrating cycling with any rhythm disrupted by frequent stops. The route into Blyth was similarly 'blyth-ted' as we again were taken on a magical mystery tour, rather than the more direct albeit busier roads. New industry was obvious here – a massive new factory making wind turbines for offshore installation. But then a juxaposition back to the coastline as recreational area as Blyth beach complete with beach huts, cafe and a links golf course came into view. A stop for an ice cream and coffee was found to be very necessary. 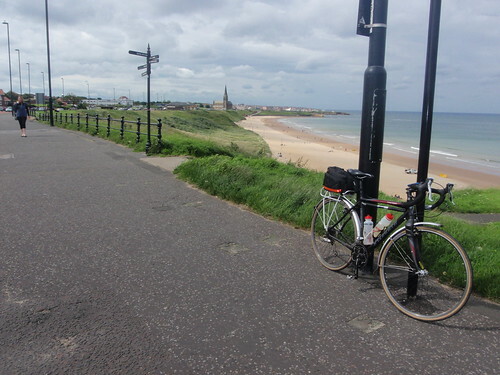 Tynemouth was the end of the route south and the end of the true coast. 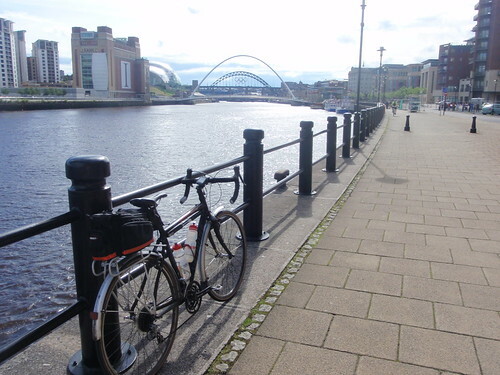 The last twelve miles of the route turns west to follow the north bank of the River Tyne into central Newcastle. It is a very urban environment travelling past the old shipyards – now building oil/gas rig sections, through Wallsend (the eastern end of Hadrians Wall) and then along the Quayside itself. 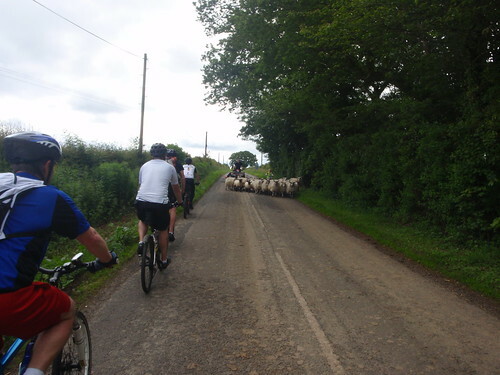 The group I cycled with were coming home to meet up with family and friends so for them it was special, it made sense. However I was left with the feeling that I'd done the ride the wrong way round – the industry and urban landscapes approaching Newcastle diminished the memories of the natural landscapes and ancient castles further north. And a finish into Edinburgh would be pretty spectacular too. Posted by Tim on October 29th, 2012.
why do such route-finding errors usually involve an unnecessary hill climb?! I think this is one of life's impenetrable mysteries. It is a fact that the end of a ride is almost more important than the start. It is the end that leaves the final aftertaste, whether bitter or bittersweet. It is the end that infuses the memories. Round here (Lancashire) people eat chip butties and fishcake barms. Enjoying these 'treats' would take more than a cycle tour in my case. Fish finger butties with cheese and vinegar aren't too bad. I did this in a tour some years ago. Durham Tees Valley Airport – Durham – Sunderland up to the Scottish Border then inland through Melrose Lammermuir Hills to Edinburgh. Then train to Newcastle, Hadrian's Wall and back to the airport. I loved Lindisfarnce Vindolanda, Edinburgh of Course, Berwick on Tweed and the Pennines..